Mike Brown, once again recording as The Man From Ravcon, unleashes another collection of weird, proggy instrumental music, this time out titled Puzzle Master. The album kicks off with Erebus, a track that sees Brown channeling the soundtrack work of artists like John Carpenter and Goblin in a big way. Some pulsing keyboards start things off before the drums and other instruments kick in, anchoring this one as a solid mid-tempo track that does a fine job of setting the mood for what the rest of the album will have to offer. Monument, the longest track on the album at over seven minutes in length, starts with some soothing acoustic guitar strumming that segues into some slightly jazzy drum beats before that Morricone-esqe guitar sound featured so prominently on some of Brown’s earlier recordings rears its head. It’s a strange collision of sounds but it works. Winter lets the piano do the talking, at least to start, letting the other instruments come into the track and build around the base that the piano lays down. There’s even some weird flute (or possibly a synthesizer sounding like a flute) in the mix here. Legacy, the fourth track on the disc, more akin to the opener, what with a return to the pulsing synth sound that the album started with – but it stays more droney and minimalist with some simple piano overtop and then a sort of wall of keyboard sounds building behind it. Tempest is the shortest track here at just over a minute in length and it’s faster than anything so far, sounding a lot like Goblin in spots and maybe a bit of Riz Ortolani’s Cannibal Holocaust work too. Metropolis begins with more Goblin inspired keyboards laying down a nice foundation for the bass and drums to build off of before the guitars and synths kick in. 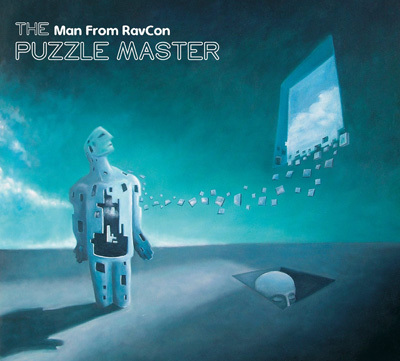 This is a bit funkier than the other tracks, while the title track, The Puzzle Master is appropriately titled as it has a sort of quizzical, curious sound to it. It’s another mid-tempo piece, which seems to be the order of the day on this album, with some impressive drum work complete with crashing cymbals creating a spacey sort of vibe. The Missing Piece is a bit more somber sounding than the other tracks, a bit darker and maybe more melancholy while still working off of the same sort of aural foundation as the rest of the album at this point – again, some nice guitar riffs work their way in here too. Moving towards the finish line, Spellbound has an appropriately mystical sound to it. More synth work and simple but effective drumming let the surf guitar sounds roll over top like a wave. The Cosmic Creeper begins with some spacey sound effects before delivering more Goblin inspired keyboard work with synth waves behind it building to an interesting crescendo while Bang puts the guitars right up front from the start, laying down a nice riff and some catchy drum beats before letting the keyboards in to play – that’s the right way to phrase it, this is the most playful track on the album, a little lighter than everything else. Starlight has a very relaxed feel to it and it stays pretty calm throughout. This one will take you to your happy place, before the album finishes up with Goodnight (Back In The Box), a shorter two minute plus finale that starts with a childlike keyboard bit that then builds into something more. There’s a violin or cello sort of sound that works its way into this in interesting ways complimented by some nice string work and plucking. All of The Man From Ravcon’s recordings are odd, and this latest collection is no exception to that trend but if you’re a fan of instrumental work and European/Cult movie soundtracks you’ll probably really enjoy what Brown and his collaborators have done here. There are a lot of really beautiful melodies underneath the strange assemblies of guitars and synths used to create this music and it’s the type of thing you want to lie down and listen to alone in the dark, just to really take it all in properly.